Above: The Karate Kid, (1984). 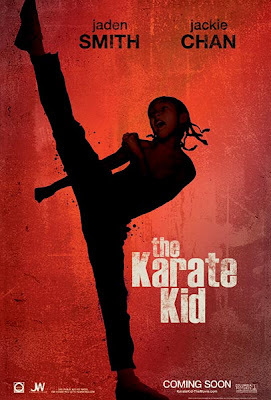 Above: The Karate Kid, (2010). Really? Was this remake necessary? 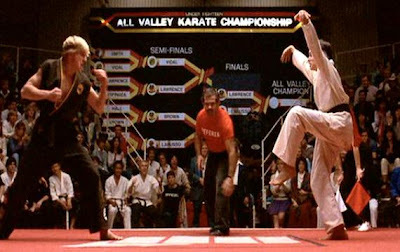 Is 1984's The Karate Kid a film that cries out to be remade? Isn't it a cultural touchstone, a film so emblematic of its time that a remake would border on cinematic sacrilege? Certainly, it's not a great film, but it's a fun one, and it's near and dear to the hearts of those who enjoyed it at the time of its release and the decades since. There's no reason why modern viewers cannot return to it in order to obtain the same amount of enjoyment. Considering the numerous homages and pop culture references still being made over the original film, it remains culturally relevant enough to insulate it from a 2010 remake. But, no. The remake is to be released this summer. What gives? Is nothing safe? Is nothing sacred? In the era which believes all children are hot house flowers, can we envision a 2010-era children's movie that offers the line "get him a bodybag!" and the villainy of the Kobra Kai dojo? Also, this film is likely to feature 100% less Elizabeth Shue. The movie can only suffer from the oversight. 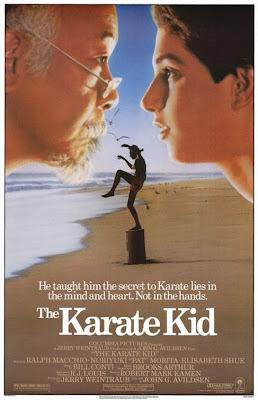 Well, the subsequent Karate Kid sequels were lesser films for the absence of Shue, too, were they not? And none of this even begins to get into how Columbia Pictures' Karate Kid had to borrow his name from that of the Karate Kid in DC Comics' Legion of Super-Heroes. Adding insult to injury, it is completely ridiculous to title a film "Karate Kid" which features a Chinese martial artist like Jackie Chan. Karate is Japanese. Actors like Chan should be using their clout to work against the Western movie industry's tendency to treat all Asians interchangeably, not aiding and abetting it! free minecraft codes for you guys.